Welders on sale at Tokentools. 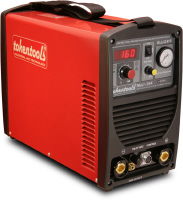 Finding the right welding equipment at a decent price is easy via the Tokentools website. Our products mostly welders on sale are available direct to the public at significantly reduced prices and are delivered direct to your door at no cost. We have tig welders, mig welders, arc welders and plasma cutters for sale. You may also collect in store if collecting from our warehouse at Wyong. Give our staff a call on 1300 881 991 to discuss your particular needs.